Now, after having referred to the LG Act ’95 multiple times over the last seven years, I quite like it. I think it reads fairly well, and any personal complaint would be the number of attached Regulations which make it hard to locate the relevant legislation being searched for. Also, the “Role of council” is poorly defined. But it is widely known that, in essence, the Council sets the strategic direction of the Local Government, and the administration implement the strategic direction. And the ‘Corporate Governance 101’ message is never to step over the line delineating the two roles. Most Councillors in the State would know they can’t go and start directing administration staff what they should do, or how they should do it. This would be a corporate governance breach. Equally so though, is if the administration ever crossed the line and started setting the strategic direction of the local government instead of the council. Going by Mr Graham’s claims, it would seem that this occurs; I am only pleased it does not at the City of Bayswater. The elected representatives should always be involved in strategy documents, and this doesn’t mean just rubber stamping a prepared one from the administration at a council meeting. It is explicitly stated in the LG Act that “council is to determine the local government’s policies”. A most worthwhile initiative that the City of Bayswater has adopted, courtesy of the CEO suggesting it, is to have a “Policy Review Committee” which is charged with working through all the policies, and recommending amendments to council as required. This committee should probably have always been in existence, and any LG which is struggling with their administration may want to start doing the same. In addition, the Audit and Risk Committee should be used to meet another LG Act stated role for the council; to be “responsible for the performance of the local government’s functions”. By using these two committees to their full potential, there is never an excuse for “elected representatives playing second fiddle” to the administration. 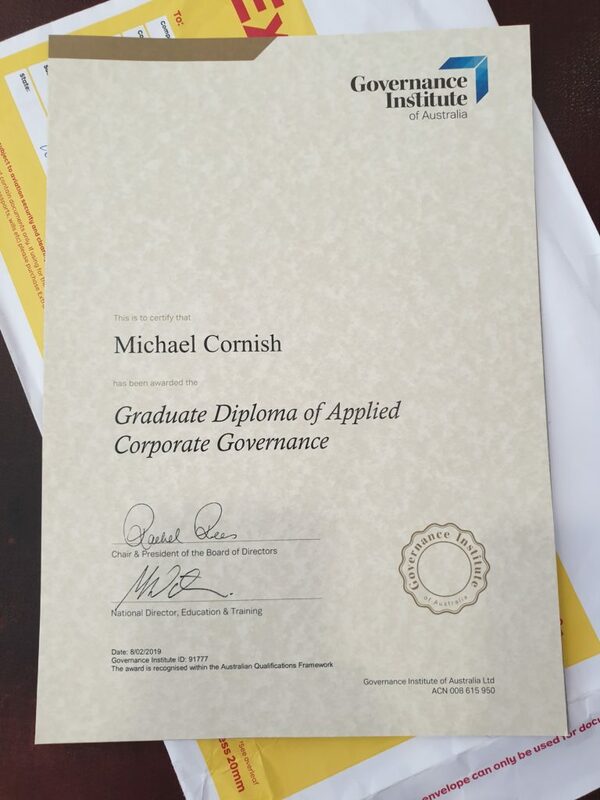 For anyone interested in Corporate Governance study, I chose the Governance Institute of Australia (GIA) rather than the Australian Institute of Company Directors (AICD) for a couple of reasons. The first is that you get an actual qualification when the six units, each with a 3,000 word assignment and 3 hour written exam, are completed. The second is that you become a Chartered Governance Professional, a Chartered Secretary and gain membership to the international Institute of Chartered Secretaries and Administrators (ICSA).